So you suffer from vocal performance anxiety? Don't worry, this is common. And there are some simple techniques that will help you overcome this. I'm going to run through a few that I use. You see, I have always been extremely nervous in front of a big group of people. And when you’re singing, it's such a personal thing that it's perfectly natural to get nervous, scared, or even anxious. So lets go through a few techniques. First... Anxiety can always be helped by slowing your breathing. Secondly, warm up your voice as much as possible. This will give you so much confidence before you go onstage. Your sound will be flowing well, and it will make you feel good about your voice. As well, it’s an absolute must to be confident of your technique. Confidence in your voice is half the battle to completely getting rid of your vocal fears before taking to the stage. Where Does This Vocal Performance Anxiety Come From? Think about it. Why do you feel anxious? It's the fear of not sounding very good. You think you will be embarrassed if the performance doesn’t go well. There is simply nothing else you could be worried about when you take to the stage. Because being onstage is magical! And all you need to do, is get through that first few minutes of your performance, so you can feel comfortable and start enjoying the show! So, do every little thing you can to get your voice the best it can be. Practice constantly and only practice technique that gets the most out of your voice. Try and record yourself as much as you can. And critique yourself. Where can you improve? What are you already doing well? 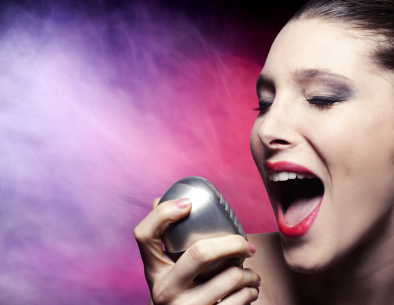 Once you know you will sound good, your vocal performance anxiety will dissolve. Another thing you can do is ask to perform in front of your friends. Just say "Hey guys, I'm finding this song pretty hard, so can I sing it for you? “It will give me an idea whether I can pull it off live or not". They will WANT to hear you sing. They are your friends, and they are interested in your voice and what you can do with it. TAKE THIS GOLDEN OPPORTUNITY to get some great performance practice in. You can get great feedback, and develop confidence in your performance. And confidence is everything when it comes to a vocal performance. So perform as much as you can. Just in case you are wondering, there is NO singer on the planet who doesn't get nervous before a performance. Even the seasoned professionals. They too, feel a few nerves before each performance. Don't see this as a bad thing. Without the nerves, your performance loses some of its passion. Use the nerves to feel the excitement. Practice hard... know how you will sound (by recording yourself often), develop good technique… warm up. And you will sound great. No doubt about it.